Barb Slone Colleen and Dalton Curtis work together to care for one of their chickens. XENIA — The Xenia Daily Gazette newspaper staff is attending the Greene County Fair each day this week covering various events and taking photos. All photos taken by newspaper staff are available for purchase on our website www.xeniagazette.com. Browse the hundreds of photos and find your friend or family member, click and purchase. Sizes range from 4×6 to poster size in matte glossy and lustre. Costs start at $3.50 and up for framed photos. Because of the large number of events to cover at the fair, not all photos are available in print. So take some time to browse — you never know who you will see at the fair. If we missed taking your child’s award photo feel free to send us one of your 4-H, Cloverbud, FFA and Open Class award winner. Those award photos will appear in print following the fair. All levels of winners are welcome. Send us a photo and information no later than noon Monday, Aug. 6. Email them to editor@xeniagazette.com or drop them off at our office at 1836 W. Park Square. Find the fair’s daily coverage in the Xenia Daily Gazette and Fairborn Daily Herald. Pick up a copy at our booth for free. Subscribe to one of our papers during the fair and get our $99 fair special for the year. This is the best price of the year. 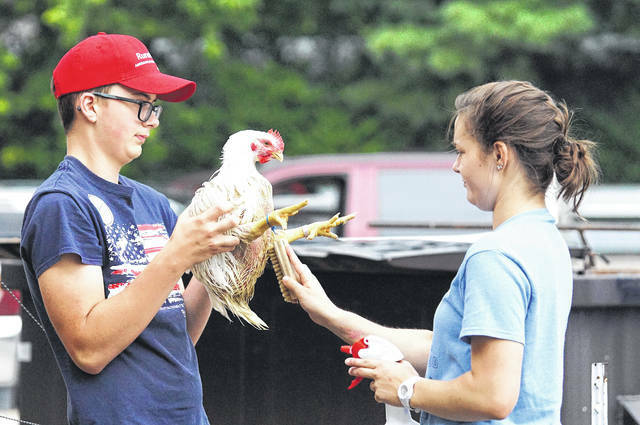 For more information call 937-372-4444.
https://www.fairborndailyherald.com/wp-content/uploads/sites/50/2018/08/web1_wildfun01Curtis.jpgBarb Slone Colleen and Dalton Curtis work together to care for one of their chickens.